You may have seen me post about how many different automatics there are. Between the K-series, Automatics and Thin-o-matics there are over 200 models. However, the series with the fewest models is the Astramatic and the Kinematic lines. Each has only two. I haven't seen an Astramatic I or II yet - they are solid 18K gold and 14K gold, respectively. I have seen a Kinematic I and have shown that on the blog. 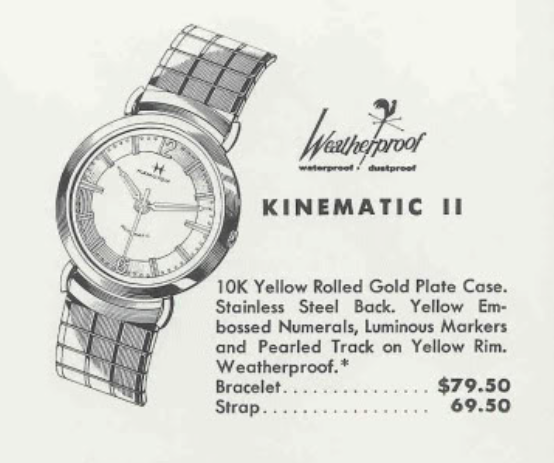 The second Kinematic is the Kinematic II from 1960. It was only made for a single year. If it looks familiar to you that's probably because the dial is identical in appearance to the 1961 Accumatic A-650. If you compare the Kinematic II to a Kinematic I (below) you may notice a family resemblance, mostly in the lugs. I think it's interesting that the Kinematic I was introduced in 1957 and was called the "I" even though the Kinematic II didn't come out for four more years. I wonder how far in advance Hamilton planned? Maybe not far enough, as the A-650 may have replaced the Kinematic II due to the potentially delicate lugs on the Kinematic II. The Kinematic II came in a 10K RGP case with a stainless steel back. Unlike the Kinematic I, the dial on the Kinematic II is really complex, with a golden chapter ring, textured dial, embossed numerals and markers and even a pearled track. Tucked inside the Kinematic II is a 17 jewel 672 movement based on the ETA 1256 automatic. I've seen only a couple of Kinematic IIs for sale over the years so I don' think they're very common. I recently landed one though and I was happy to be able to get it because it has an excellent dial. It even came with it's original box. The stainless steel back screws on and off. This one is a little off-center as I don't think the seller but it back on properly. Hopefully it's not cross-threaded and damaged. The 672 is an early version of ETA's movements and would soon be replaced my the 689 series in the Accumatic line. You find this grade was also offered in the earliest automatics that Hamilton offered in the Illinois brand. Without the crystal in the way, you can see that the dial is very complicated. I doubt that it could be properly refinished to look like new - but fortunately I don't need to find out. This watch has a broken set bridge. That's the little lever that holds the set lever in either the winding position or the setting position. I'll need to replace that. Everything is cleaned and dried. I stole a set lever from a 671 movement - that's the manual wind version of the 672. The 671 is based on ETA 1080 grade - so any 1080 or 1256 could donate a set bridge. The watch is back to running condition - so let's see what the timer has to say. Uh oh. There's something inside making noise. I'll reclean the hairspring and hopefully take care of it that way. A new crystal will show of the excellent dial much better than the old crystal that the watch came with. And here's the finished project. The bracelet that it came with isn't original to the watch but it fits it nicely and looks pretty good, I think. The Kinematic II is a nice looking watch and looks very "Summery" like a nice sunny day. Wonderful restore! I have a Kinematic II, and have to get it restored (complete with the double signed S&W) from one of the original owners of the S&W manufacture, Mr Wuischpurg. He should be responding any day (hopefully) with a quote.